Hilltop Children Center’s full-day early childhood preschool and pre-k classrooms are for children ages two to five and are open from 7:00am-6:00pm, Monday-Friday. Inspired by the schools of Reggio Emilia, Italy, educators approach preschool education with a play-based, child-centered, reflective teaching practice. 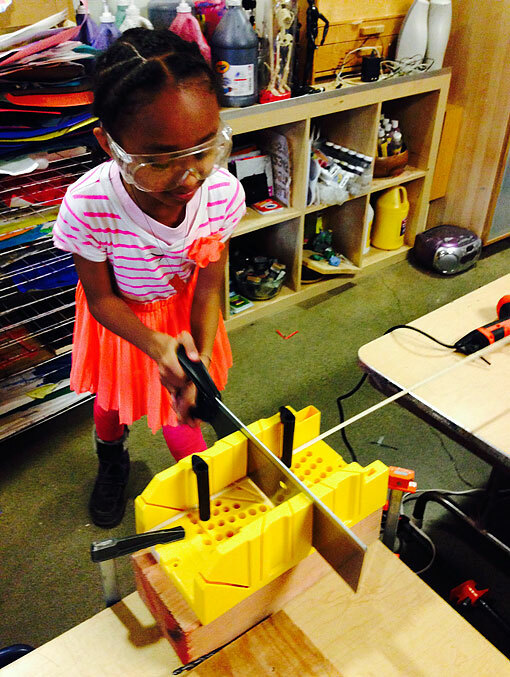 We want to understand what children are passionate about, challenge their thinking, and support their social-emotional, physical, creative, and cognitive growth and development. What are the hours for the full-day preschool program? All of our full-day preschool classrooms are open from 7:00-6:00. The majority of children arrive between 8:00-9:00 and leave between 4:30-5:30. Hilltop offers 3, 4, and 5-day per week options. For part-time options, we ask that you provide your first and second preference of Monday-Friday days; we will do our best to accommodate your first request, if possible. We will set your schedule upon enrollment. Can my child be in diapers? The toddler rooms, ages 2-3, have diaper changing facilities. The older classrooms, 3-5 do not have access to diaper changing facilities. Children who are just gaining competency (i.e. – still occasionally having accidents in underwear), are welcomed to work though that final phase with our nurturing and skilled staff. Hilltop provides morning and afternoon snack for our full-day preschool program. Families provide lunch. Our contracts for full-day preschool classrooms are a 12-month commitment, as we have found the consistency of children’s experience throughout the year is key to the high-quality of their learning environment. 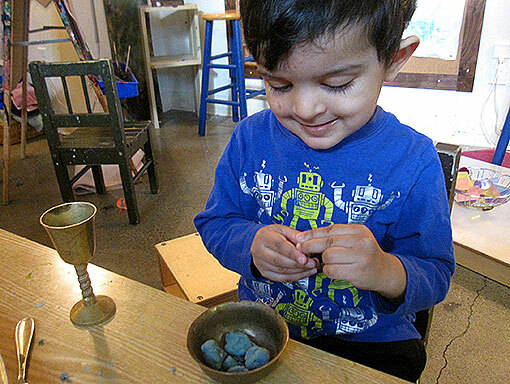 Rohan spent about 40 minutes working with the play dough in the studio this morning meticulously shaping the meatballs he was to eat for breakfast. He shaped them through a slow and intentional process of construction, starting out with a very small piece of play dough and slowly adding really tiny pieces, one at a time. He’d roll each small ball through and around his fingers with its added tiny piece of dough stuck to the outside, until it seemed smooshed into the ball enough. Then he’d repeat the process again and again and again until the meatballs were just the way he wanted them to be. Occasionally he would stop making them and put them in the bowl. Some times he would pretend that he was really having breakfast and blow on the meatballs as thought they were still hot. Typically I see Rohan engaged in big physical play, or dramatic and imaginative pretend play. He doesn’t often engage with sensory or art materials for extended periods of time, as he does with these other kinds of play, so it was great to see him spend such a dedicated amount of time with the squishy and salty play dough. I appreciate that he was able to find a new and different way to act out his ideas for pretend play. Often Rohan acts out scripts from books, television shows, or movies, all while up high on a piece of furniture or with broad and dynamic announcements of his intentions. During his meatball breakfast play this morning, Rohan created his own script instead. Has Rohan been more creative in his pretend play at home recently, finding ways to still use his imagination without the direct script from other sources? In what ways can we (parents and teachers) continue to support the more creative side of his imaginative play?